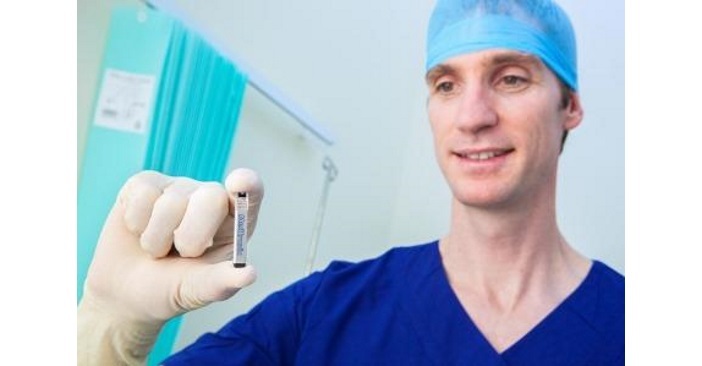 Electrophysiologist, or ‘‘electrician of the heart,” Dr Brad Wilsmore made history on May 6, becoming the first specialist to insert a heart monitor that is about a third of the size of a AAA battery at Lake Macquarie Private Hospital. This is the first time the heart monitor has been implanted outside of a clinical trial setting in Australia. Without appropriate diagnosis and treatment, the effects of undetected or misdiagnosed heart rhythm disorders can be fatal and occur without warning. The device, Medtronic’s Reveal LINQ, is an insertable cardiac monitor (ICM) which will be used to aid clinicians in detecting minute changes in a patient’s heart rhythm by continuously monitoring, recording and storing data inside the device for up to three years. In addition, due to its wireless monitoring capabilities, physicians can be notified quickly if patients need medical attention between regular appointments. The number of Australians living with heart rhythm disease is currently unknown, with high numbers of the population undiagnosed. For example, while more than 400,000 Australians are diagnosed with Atrial Fibrillation (AF), a further 100,000 Australians are estimated to be living with the condition and undiagnosed. Stroke is one of the most serious consequences of AF and imposes substantial personal and economic costs. Ineffective or a lack of stroke prevention treatment leads to even more strokes, poor outcomes for patients and is costly to the Australian health system. Through use of ICM, these diseases may be detected to prompt appropriate clinical management. Technology including pacemaker therapy and implantable cardioverter defibrillator (ICD) therapy is available to treat the condition once detected. Adding a level of complexity for patients with underlying heart rhythm disease, their symptoms (‘fluttering’ heartbeat, an irregular pulse, weakness, dizziness, fainting and/or seizures) can appear similar to other diseases such as epilepsy. This highlights the challenge clinicians face in appropriately diagnosing and treating heart rhythm disease, opposed to other heart or neurological conditions.